Mount Kailash is the holiest mountain in Tibet and probably all Asia. It is situated in the Ngari region of western Tibet, which is one of the highest, loneliest and most desolate places on the planet. 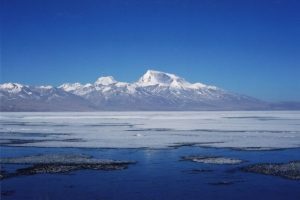 It rises perpetually snow capped 7,500 metres from the high desert plains which surrounds it. The shape of the mountain is a near perfect pyramid. The Buddhists believe is was the location where the Tibetan Buddhist saint Milarepa overcame the obstacles created by followers of the ancient Bon religion. Tibetans also called the mountain Kang Rinpoche which means precious snow mountain. Hindus consider Mount Kailash to be the mythical mount Meru; the world’s spiritual centre. Mount Kailash is also the source of three of Asia’s most important rivers; the Ganges, the Bramaputra and the Indus. 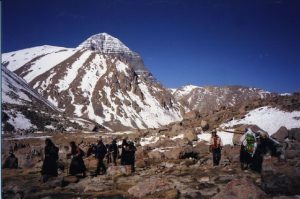 This trek circumambulates Mount Kailash and crosses the Drolma La pass which is 5,800 metres. Mount Kailash is not an easy place to get to. 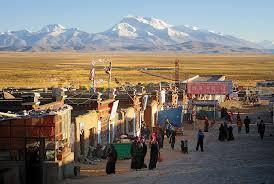 Since it is located 1,250 kilometres west of Lhasa. For the last 500 kilometres there is no road as such just a rock-strewn track with several rivers to cross and with no bridges. Our trek was organized by the Samye Ling Tibetan Buddhist monastery in Scotland UK together with an international adventure trekking company. This trek is a fund-raiser to help them construct a large Stupa at their monastery. (A Stupa is a symbolic representation of Buddha’s spiritual mind or Dharmakya.) The physical shape of the stupa is based on the shape of Kailash itself. Each part of a stupa illustrates and represents different stages of Buddha’s path to enlightenment. Building a stupa is of great significance in Tibetan Buddhism because it is a very powerful way to purify negative karma and also a way of accumulating great merit. Stupas can be of almost any size ranging from a few centimetres to the stupa on the Indonesian Island of Java called Borododur which is 200 metres in height. This trek took place in the Tibetan year of the wind horse . It is the year which Tibetans believe is the most beneficial year in which to do the Kailash trek. The reason for this is that to do this pilgrimage in any year will wash away the sins of a lifetime. But to do this trek in the year of the wind horse will wash away the sins of several lifetimes. The end of our trek around mount Kailash is also planned to coincide with Sawa Daga at Tarboche. This is the date [the varies because of the lunar calendar but it happens around the 15th May each year] which commemorates the Buddha’s birth and attainment of enlightenment. There were 15 of us on the trek excluding guides, drivers, porters and cooks. In addition to cost of our trek, we each donated at least 1,000 $US towards the construction of the Stupa at Samye Ling Scotland. Our guide was Bradley Rowe a Fellow of the Royal Geographical Society and a very experienced Tibet expert with an international reputation. Our group comprised of myself [from Thailand], 1 German, 2 from the US, 2 from Canada, 9 from the UK. Our ages ranged from 19 to 69 years old. We all flew from different parts of the world and met up in Kathmandhu Nepal for the departure to Tibet. The complete trek lasted 6 weeks in all, firstly flying to Lhasa, Tibet to acclimatize and sight-see for a few days. Then on to the oldest Buddhist monastery in Tibet; the Samye monastery. From the Samye monastery we went by jeep 1,000 kilometres to the foot of Mount Kailash. Then we returned overland from Kailash to Kathmandhu by jeep. This trek proved to be one of the most memorable events of my life so far. The journey was full of both highs and lows. The lowest point was the sudden and untimely death due to the acute on set of altitude sickness of one of our Nepalese cooks. He was only 28 years old and leaves behind a wife and two sons. He died within 5 hours of experiencing the first symptoms. He did have a very peaceful death and it happened on the shores of lake Manasaraovar in Tibet whilst helping others to complete their pilgrimage. This is equally scared to Hindus and Buddhists alike. It is said by both Hindus and Buddhists that to die on a pilgrimage is one of the best ways to end one’s life. I have written to the travel company which organized this trek telling them that they must change their ways of treating Nepalis who come to Tibet in open trucks sitting on fuel drums. The road from Kathmandhu to Tibet is well known for inducing altitude sickness because the road is not a gradual increase in gradient from Kathmanhdu’s 500 metres to Tibet’s 3,500 plus metres. This road undulates over four high passes all of which are over 4,000 metres and then plunges to 2,000 metres. It is this continual undulation between these heights which makes acclimatizing to high altitude very difficult. Unlike the Nepalis, our group of westerners flew direct to Lhasa (Tibet’s capital) at 3,700 metres. Any altitude problem we only experienced once and had the time to adjust to this problem. The high point of the trek was the day we successfully crossed over the 5,700 metre Drolma La pass on mount Kailash. The pilgrimage began in Kathmandhu Nepal where we all met up. Prior to starting the trek I arrived a few days before the rest in order meet up with my friend and my teacher’s (Ringu Tulku Rinpoche’s) elder brother Salga who lives in Kathmandhu. The day before went to Tibet we went to see the recently recognized reincarnation of the Kagyu Regent Jamgon Kuntrul who now resides in the Polahari monastery 20 kilometres from Kathmandhu. The monastery was set high on a mountain, which has commanding views of the entire Kathmandhu valley and the snow capped Tibetan Himalayas in the distance. Jamgon Kuntrul is a 6 year old boy. In the Tibetan Kagyupa Buddhist tradition, when an important teacher dies it is believed that they deliberately reincarnate some years after their death in order not loose their accumulation of wisdom so that they can pass on this benefit to others. These reincarnate lamas or Rinpoches are identified by a series of elaborate searches followed by complicated interrogation processes. Once it is believed that an incarnate Rinpoche has been discovered then the candidate is taken to see the current head of lineage (in the Kaguypa’s case the Karmapa) to verify – or not – the claim. When the Karmapa, the head of the lineage, dies finding his reincarnation is also a political as well as a spiritual mission. The head of a Tibetan lineage has access to tens of thousands of believers as well as several global bank A/cs. It is the Dalai Lama who then intervenes on such occasions and makes the final decision. When the Dalai Lama dies then the heads of all of the four different Tibetan Buddhist lineages make the decision in conjunction with the Dreplung Orcacle (But that is an entirely different story). After receiving the blessings from Jamgon Kuntrul Rinpoche, our group then boarded our one hour South West China Airlines flight from Kathmandhu to Lhasa Tibet. The route flies directly over mount Everest and was clearly visible not that far below us. On arrival at Lhasa’s Gongar airport, one of our party was questioned by the immigration officials about a book he had in his possession. It was a copy of Heinrich Harrier’s “Seven Years in Tibet”. This book is banned in Tibet and our group member was lucky only to have his book confiscated. Although it was a three hour journey from the airport to Lhasa the Potala of Lhasa could be clearly seen 70 kilometres away. The Potala is a 17 story building constructed by the 4th Dalai Lama on a very large granite rock some making its total elevation 3,700 metres high. When it was built about 350 hundred years ago it was the world’s tallest building. It was four years since I had last been in Lhasa so I was intrigued to see what had changed. There were both good and bad news. The good news was that local people looked much better fed and physically stronger. One of the reasons I discovered later that the locals were looking healthier was because of the newly introduced local fruit and vegetables. The Chinese have introduced several high tech green houses which use a combination of solar power and hydroponics to produce large quantities of excellent fruit and vegetables. Prior to this all fruit and vegetables would have to be imported via a 6 day truck route from Chendhu. The bad news was that the city of Lhasa was now only Tibetan in two sections of the city; the Potala and Jokang. The rest of the place was full of grotesque modern China concrete based architecture. On arrival at our hotel, we were greeted by our Tibetan guide Sayang. In Lhasa we spent three very pleasant days relaxing and sightseeing. All of us were well apart from one German lady who had quite severe altitude sickness. She finally recovered on day three. Throughout the entire trek I never had suffered from altitude sickness because I took a daily dose of 500mg of the drug Diamox. This is controversial regime of treatment because it acts as a palliative and in some cases could be quite dangerous. The main symptoms are masked without the person fully realizing it. It should not be taken by people with ill health or kidney problems. After Lhasa the next stage of our journey was to visit Samye monastery. This place can only be reached by a 3 hour jeep ride from Lhasa and then a 2 hour crossing by ferry of the Tsangpo or Bramaputra river. Then there is another 1 hour ride on a truck across mud flats and sand dunes. The reason the ferry takes so long is because this river is extremely wide with treacherous currents and shifting sand bars. These ferries are flat bottomed and carry supplies, animals and the occasional tourists. They do not operate to any predetermined schedule; instead they only go when they are full. Consequently we had wait an hour or so before the ferry set out. The river valley has been created by the Tsangpo and is about 20 kilometres wide bordered by majestic snow capped mountains on each side. Whilst we were crossing this river a storm started and just finished as we arrived at the other side of the river. Whereupon the skies cleared with a double rainbow revealing the ancient 2,000 year old Samye monastery. Since this was the very first Tibetan monastery to be created it is a very special place and avoids the sectarianism to be found in some Tibetan monasteries which are founded by one or other of the four main schools of Tibetan Buddhism (Kaygupa, Ningmapa, Gelupa and Sakya). In fact all schools were equally represented and performed each other’s pujas and rituals on a rotation basis. We spent two days in and around this monastery and on the second we climbed a 500 metre hill above the monastery to see the amazing vista which before us. The next stage of our journey was from Samye to Zhigaste, a distance of about 350 kilometres. After retracing our steps across the Tsangpo river we rejoined out jeeps and set off west along well maintained roads. I did notice that since my last visit some 4 years ago the Chinese had planted 1,000s of trees to prevent soil erosion. From now on we would gradually gain height on each day of our journey until we reached the foothills of mount Kailash. Zhigatse is 3,700 metres and apart from the very impressive Tashilumpo monastery is completely Chinese. We arrived after dark and enjoyed our last night in an hotel for at least 4 weeks. In the morning we visited the Tashilumpo monastery (the seat of the Panchen Lama). Although it was very well maintained the atmosphere was more like a museum than a place of worship. The Chinese had driven out most of the monks and no actual worship was carried out any more: they said it was for security reasons. However, the ceilings and walls were decorated in authentic and traditional Tibetan Buddhist style. Later that day we set out for our rendezvous with the supply trucks which had come overland from Nepal to meet us at Lhaste (4,000 metres). The distance between Zhigaste and Lhaste was about 250 kilometres. After Zhigaste, the road began to deteriorate rapidly until when we arrived it was just a rock strewn track. The trucks failed to materialize by nightfall. Since these trucks contained all our camping gear we were compelled to overnight in a disgustingly dirty hostel. At dawn the trucks arrived and they explained that they had been delayed by mechanical problems with one of the trucks. Later that morning we set forth on our next leg of the journey to Salga (4,300 metres and 150 kilometres from Lhaste). For here on we were to experience the worst traveling conditions so far. This was our first night under canvas and it was really great to wander away from the camp site at night and look up in amazement at the wonderful sight of all the stars. In addition to this, there were many shooting stars sweeping across the sky. The next day we set off on the long and difficult rubble-strewn track which would lead us to Paryang 200 kilometres away. If the track had been bad the day before this was much worse. En route we had to cross sand dunes and avoid large rocks which had partly blocked the track caused by rock falls. Despite this we were able to meet several nomads along the route. This happened when we stopped for a rest in what appeared to be empty wilderness. Then out of nowhere a small group of 4 or 6 nomads gradually came to get a closer look at us. On occasion they would invite us back to their tents to have some Yak butter tea. In one tent we saw that the nomads had rigged a satellite dish and solar panel on the top of the tent and inside was a TV set complete with powerful batteries. Night was falling as we arrived at Paryang. This was a desolate place in the middle of a vast plain same 4,200 metres high. As the sun set we could see the wonderful panorama of the snow capped Nepalese Himalayas with peaks such as Annapurna (8,000 metres) in view some 500 kilometres away. The place where we pitched our tents was on the edge of Paryang and soon we were visited by packs of very large very wild dogs. These dogs were both aggressive and enormous. During the night a pack of them were running around and crashed into the ropes holding my tent in place. We were very happy to leave Paryang and set off towards our next overnight stop, Lake Manasaraovar. This is the most holy lake in Tibet and is located at a height of 4,500 metres. This was to be our longest day so far because we had to cover a distance of 200 kilometres over even more difficult terrain. As we traveled westwards to these very remote parts of Tibet we began to encounter more and more wild life. These included herds Kyangs (wild horses), black necked cranes (very big birds the size of a man), Gazelles, Eagles, Bears and Wolves. On this part of the journey we had to cross a few rivers without bridges. On one river our jeep got stuck so we had to climb out of the vehicle and swim ashore. Then the other jeeps in our party pulled it out. All this was to the great amusement of local nomads who were watching us all the time. As afternoon was drawing on we began to go over one of the highest drivable tracks in the world – the Maryum La pass. This pass is 5,300 metres high and there is no actual track. Jeeps just simply drive over the mountain side as best they can. We were very fortunate because there was good clear weather. Had there been a snow storm we would not have been able to pass. As the sun was setting we arrived on the shore side of lake Manasaraovar. Here we were greeted by 50 or more Tibetan pilgrims who had also crossed Tibet to go to Mount Kailash. Some of these Tibetans had actually walked over 2,000 kilometres and it had taken them between 2 to 3 years to accomplish this. Others had packed themselves into the back of open trucks taking several weeks to arrive here. There was a tremendous feeling of accomplishment amongst everyone. Raised on a ridge above the lake was a place aptly named Kailash View. From here we got our first sight of the holy mountain of Kailash some 200 kilometres due west, its snow-capped peak of 7,400 metres glimmering in the setting sun. In our elation we had forgotten that our main support truck still had not arrived. We were traveling in modern 4 wheel drive Toyota Landcruisers and the support truck was a beat up Chinese Feng Dong truck. The truck had all our food, water, tents and other supplies. We were beginning to be very concerned as to what had happened to the truck. Just as darkness was falling the truck emerged out of the darkness with some very disturbing news. A terrible story about one of the Nepalese cooks began to unravel. When their truck crossed the Maryum La pass one of the Nepalese cooks complained of a serious headache and 30 minutes later he was semi-conscious. Although they had a portable Gama bag (decompression system) in the truck, the Nepali guy did not make any improvements despite spending an hour in it. They then decided to press on to Lake Manasaraova and hope that the slight drop in altitude might help him. When they arrived at the lake the Nepali guy had gone into a coma and was extremely cold. I gave him my –40C down duvet jacket in an attempt to stabilize his temperature. The group leader Bradley Rowe realizing the seriousness of the situation decided to travel through the night with the Nepali Siddar to find the local Chinese military base in the hope that they might be able to offer medical assistance. This base turned out to be 50 kilometres away and when they arrived he was dead. The Chinese authorities questioned them closely to make sure that no foul play had happened. When they had satisfied themselves that he had died of natural causes they allowed them to leave with the body. All this took about two days whilst we waited at our camp site on the shores of Lake Manasaraorva. Before Bradley left he asked me to take charge of the group. In his absence one of our group from London (Sharon) suddenly developed symptoms of a high temperature, shivering and vomiting. I was not sure whether this was another case of altitude sickness or something else. I assumed it was altitude sickness and got her inside the gamma bag and gave her some oxygen from a cylinder we had. This had little effect so I organized a rota for people to watch her through the night and gave her hot liquids with dehydration power. By morning she was no better so I decided that perhaps it was a bacterial infection so I gave her a course of Ibuprofen from my own medical kit. In two days, although weak,she seemed much better. I think she must have picked up some bug from the nomad children she keep on hugging whom we had met en-route. A shocked Bradley Rowe arrived back in camp two days after leaving with the news of the Nepali’s death. 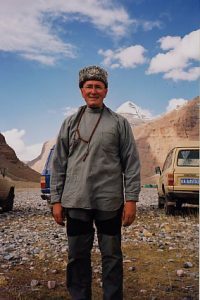 Although Bradley had been to Tibet over 30 times before he had never witnessed a death by altitude sickness. The Nepali who died was a Hindu and they believe that you must not bury the dead but cremate them. This was another problem because the nearest tree was 2 days drive away each way. We were supposed to have been spending these days walking round the 150 kilometre circumference of this lake but instead we stayed put and did short excursions to local monasteries in the vicinity. Four days later Bradley Rowe came back with a truck-load of wood. But the Nepalis said more was needed. So the local Chinese army based came to the rescue and provided some kerosene to help the flames along. Whilst they were away we were concerned that the body of the Nepali guy, which rested in a spare tent near our camp, was not eaten by wolves or other predators. To prevent this from happening we kept a 24 hour vigil and lit fires. In the Hindu tradition lake Manasaraova is one of the most holy places in the world and have your ashes scattered on the lake is considered to be most auspicious. When the funeral pyre was lit there was a mixture of both great sadness and great joy. Somehow these distressing events could not detract from the stunning and wild raw beauty of this location. Ever since we arrived the lake was completely frozen. This apparently is very unusual. To the south of the lake is massive Gurla Mandata mountain rising some 8,400 metres towards the sky. To the north the pinnacle of Mount Kailash of 7,500 metres. Each night we camped on the lake shore. It was very cold. An American guy in the party had a digital thermometer with him and he took great pleasure in announcing each morning how cold it has been the previous night. He recorded typical night time lows of –15C. Fortunately I had an excellent –30C down duvet. Our next camping site was on the opposite shore of the lake at Chiu Gompa. Gompa is the Tibetan word for monastery. 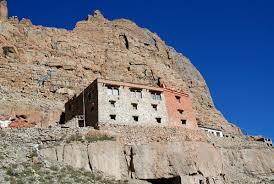 It was at this Gompa that the saint (Padmasambava) who brought Buddhism from India to Tibet spent many months here. On this side of the lake the wind was especially strong causing very annoying sand storms. It was in one of these storms that we lost an entire tent which was blown high up into the air to be lost forever. Fortunately we had a spare tent. After a brief excursion to Gossul Gompa we headed off for the settlement of Darchen [some 100 kilometres away] which is the main starting point for the circumnambulation or kora of mount Kailash. Normally Darchen is a very sleepy small village with about 50 local inhabitants but when we arrived it was tent city. As far as the eye could see row upon row of every size of tent had been pitched. Army tents, nomad tents, first aid tents, tents constructed for Buddhism religious purposes and the occasional tent with westerners. We estimated that the normal population of 100 had swollen to around 30,000. It was decided not to stay in Darchen because of pollution worries and the shortage of safe water with all these visitors in residence. We had to visit Darchen to obtain permits from the Chinese and also the lady from the UK (Sharon) in our group who had been ill had been told not to do the trek because she was still rather frail. We found her lodgings and left her protected by a Nepali cook. At last the main trek was about to begin. Although the length of the trek was only 40 Kilometres it would take us four days to complete. Although I had previous mountain trekking experience this was the first at high altitude. It was impossible to predict how my body would react. At about 12.00 noon we set off out of Darchen towards Tarboche about 8 kilometres away. This was an easy gently raising well defined track with many other Tibetan pilgrims along the path. One of our truck drivers had decided to run round the mountain and said he could do it about three times in the time it would take us to complete one. I was part of the advance team who would go on ahead and look for a suitable site to pitch the tents. Behind us was our intrepid guide Bradley who was negotiating the price of six Yaks, that were to carry our heaviest gear. We just had light day packs. Tarboche is a very atmospheric place. It is nestled under the snow capped Kailash at the entrance to the northern Kailash valley. It is here that we hoped to celebrate our kora in four days time. Already these people were beginning to organize for the Sawa Daga festival. 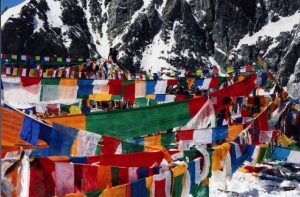 The focus of the ceremony was the raising of a 100 metre high pole around which would be draped hundreds of Tibetan prayers flags by the returning Kailash pilgrims. Raised on a ridge high above Tarboche was an area set aside for sky burials. In this part of Tibet there is no topsoil so when people die their bodies are cut up into about 12 parts and fed to the Lamagyas (Tibetan Vultures). Having surveyed Tarboche we set off into the mystical north Kailash valley. This part of the trek was easy walking with a good well-defined path. The scenery was spectacular. The wide valley at Tarboche suddenly begins narrow and the steep granite slopes on both sides of the valley starts to block out the sun light. After walking about 10 kilometres we find a very good place by the river to make camp just below the Chukku Gompa. Even though I had a good night’s sleep I awoke before dawn to a rather strange sound. It was a kind of distant murmuring. As I awoke more I realized it was the sound of thousands of people chanting in Tibetan “Om mane peme hum”. 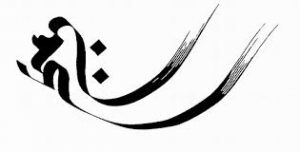 This phrase in Tibetan has several meanings. It symbolizes the entire teachings of Buddha. When repeated 1,000s of times it takes on a powerful spiritual significance which benefits all in earshot. When I did crawl out of the tent I saw an amazing sight. There were in the distance a long line of humanity. As far as the eye could see thousands of Tibetan pilgrims chanting as they did their own koras of mount Kailash. It was at this moment that I began to feel part of a much larger even than a few westerns trekking in Tibet. These Tibetans had no creature comforts such as tents they must have walked from Darchen setting off about 3.00 am to arrive at Chukku Gompa at dawn. As dawn came we estimated that at any one time there must have been about 15,000 Tibetan Pilgrims doing the Kailash kora at any one time. The next day would be tough because we started to move 6 kilometres from an elevation of 4,500 metres to 5,000 metres. Although 500 metres might not seem much at high altitude every metre above 4,500 metres means an exponential loss in oxygen. The first part was quite easy through the winding valley giving awe -inspiring vistas of the north face of mount Kailash. I did alright until we got opposite Dirapuk Gompa at 4,900 metres. Then I was quite exhausted due to the lack oxygen. It became difficult under foot because of the snow and ice we were encountering. Eventually I arrived at our 5,100 altitude where the porters had already pitched our tents. I slept well and the night time temperature fell to –20C. It was with a little trepidation that I got out of my tent to figure out how I could do the final 400 metres to the Drolma La pass; the climax of out trek. Suddenly I heard the beautiful lilting tones of a Tibetan lady’s singing as she made her way to the Drolma La pass. I never saw this lady because there were still many hundreds of pilgrims on the path but I never lost ear shot of her voice. In less that 2 hours I found my self at the Drolma La. Before getting to the Drolma La pass there is a special place called Shiwa Tsal. It is here that pilgrims leave items of clothes they have worn as a symbol of their life before crossing the Drolma La. To cross the Drolma La is the chance to leave behind past sins and indiscretions and begin a new life. I whilst I was wondering which item of clothing I should leave behind my climbing breaches unaccountably ripped. So I changed pants and left the old ones behind. As I approached the Drolma La the atmosphere amongst the pilgrims became more intense. There was a complete cross section of people along the way ranging from 80 years plus women to six year old children. There was even a group of men carrying a very large 15 metre tree trunk. This was to be placed at the Drolma La from which Tibetan prayer flags would be attached. Arriving at the Drolma La was rather like being at an exotic carnival. There were hundreds perhaps thousand of people all congratulating themselves on their achievement. Then there were groups of pilgrims praying to mount Kailash and others enjoying picnics in the snow. The weather throughout the trek had been spectacular with pristine blue skies and very little wind. Once all of our group had arrived we all had a great celebration and felt a genuine sense of achievement. After taking many photographs and simply enjoying the moment we set off along the kora path down to our next overnight camp site at Shapje Datok. This day’s trek was about 8 kilometres. The next day was to be the longest part of the trek (24 kilometres) to Zhong Chu. This route was very different from what we had done previously. Not only was it all down hill, but we crossed into very arid almost desert like conditions. Along the way we stopped at the famous Zutulpuk Gompa where the Tibetan saint Milarepa had spent many years meditating in a cave. Then we had pass through the Transger canyon. This involved walking through a desert-like landscape with precipitous drops down to the river bed 2,000 metres below. Eventually we arrived safely at our campsite just 4 kilometres from our starting point at Darchen three days ago. After a night here we would move on to Tarboche by jeep to witness the Sawa Daga celebrations. We found a place just outside Tarboche to pitch the tents and went inspect the place where the celebrations were due to happen the next day. Tarboche normally is totally uninhabited apart from a few nomads and monks from the local Gompa. The topography of the place made it very suitable for the forthcoming Sawa Daga celebrations. First of all it had the awesome back drop of the snow capped mount Kailash itself. Secondly, there was a very wide flat space about the size of two full-sized soccer pitches. Thirdly there were steep slopes around this open space which formed a kind of natural amphitheater. In the middle of this space preparations where well in hand for erection of a massive tree stump upon which were already many hundreds of brightly coloured Tibetan prayer flags. The next day dozens of strong Tibetans would raise the pole and then thousands of people would parade in clockwise rotation around the pole. The next day dawned on Sawa Daga and it started with Buddhist prayers led by a Tibetan Rinpoche. Then horsemen from Eastern Tibet some 2,000 kilometres away demonstrated their amazing prowess by daring acrobatic feats on their magnificent steeds. 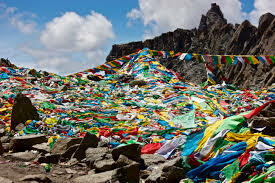 By this time every inch of space had been occupied by pilgrims from all over Tibet to watch the spectacle of raising the tree stump covered in Tibetan prayer flags. It was not unlike the Swedish ceremony of the midsummer festival in some ways. 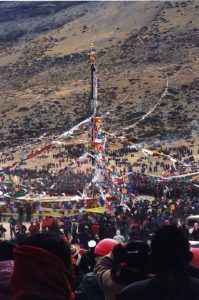 Here at Tarboche there was a crowd of at these 30,000 people gathered in this dramatic and remote spot of western Tibet to celebrate both there kora of Kailash and also to celebrate Buddhas birth and attainment of enlightenment. Whole family groups were in amongst the crowd enjoying frugal picnics of tsampa [roasted barley mixed with hot yak butter tea] and dry yak cheese. I had eaten tsampa every day of this trek and it had the twin benefits of filling my stomach and keeping me regular. The clothing the Tibetans were wearing indicated which part of Tibet they originated. Women from the Amdo region in the north had fantastic astrakhan wool hats which looked chic enough not to be out of place on a Parisienne cat walk. 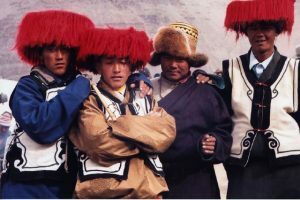 The men were no less spectacular with Kampas from Eastern Tibet with long hair adorned with semiprecious amber and coral stones tried together on scarlet ribbons. By comparison the few westerners that were there looked drab. In the early part of the afternoon we set off the five day jeep journey back to the Nepali border at . 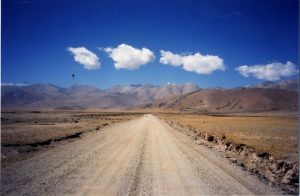 We began our journey east across the vast dessert plains which surround Kailash. Retracing our outward journey we managed to cross the Maryum La pass just as nightfall was approaching. We found a sheltered place to pitch the tents by a tributary of the Tsangpo river. On day two of our back journey we camped just before a settlement called Saga. On the following day we crossed the now much larger Tsangpo river by a rather unusual cable ferry. It worked by having a large wooden raft (big enough to take 2 jeeps and 1 truck) which was attached to strong overhead wire cables which were operated by diesel engines. The forward thrust of the raft was partly achieved by the diesel engines but also partly by harnessing the sheer power of this big river. Once the 5 jeeps and the truck were all safely across we began the ascent of the Kyirong mountains. These were even bleaker than we had previously experienced and the track was very difficult to navigate. All of our vehicles were becoming stuck along the way. Having negotiated this obstacle we then descended to the valley on the edge of the Siling plain. We pitched tents and had our last meal under canvas in Tibet. The next day we embarked on day four of our return journey to Nepal. This day we had some of the finest scenery of the entire trip. All of the day was spend crossing the vast Siling plain skirted by the Pekhu So lake some 150 kilometres in diameter. This plain is larger than Scotland and is dominated by the massive single peak of mount Shishapangma (8,200 metres). After traveling over three weeks on rock-strewn tracks we arrived at a concrete highway. It was the so called “friendship highway” which links Lhasa with Kathmandhu. We drove along this road until we reach our last overnight stop in Tibet at the frontier town of Zhangmo. Here we checked into a Chinese hotel for the night. Arriving in Zhangmo was a very unpleasant experience. Like may far-flung border towns it was full of low life, drug dealers, prostitutes, smugglers and thieves. The hotel where we stayed was quite disgustingly dirty with no running water. Fortunately all this was only for one night. Zhangmo straddles the Tibetan-Nepali border and no non-Nepali vehicles are allowed in Tibet and no non-Chinese vehicles are allowed in Tibet. Consequently we were to loose our trusty jeep drivers here. We all collected a fair sized tip and which gratefully received. We all had multiple entry Nepali visas so no problems were anticipated at the border crossing. How wrong could we be! Crossing the Tibet Nepal border is a bizarre experience at the best of times. Having had our passports examined by the Chinese border guards we then were driven in the Chinese Jeeps to a sort of no mans land between Tibet and Nepal. Here we said our goodbyes to our Tibetan drives and guides and then walked the 500 metres to the Nepalese check post. Here they told us that we have to pay a special border tax of 100 US $ each. This was a rather obvious scam. So a 3 hour negotiation took place until they told us that this was the going rate for “protection” against robbery by the Maoist rebels who were hiding in the forest just over the border. In the end we paid up and later claimed this back from the tour operator in Kathmandhu. We then all climbed onto a Nepali bus and headed down the valley on a 5 hour journey towards Kathmandhu. 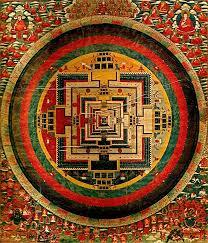 In Kathmandhu I paid another visit to Salga and commissioned a Tibetan Thanka painting of the Kalachakra mandala. This a one dimensional representation of the paths to enlightenment. Salga is a famous painter and is very busy. I had to wait at least 18 months for the painting to be finished. We then all departed and flew back to our various homes in the US, Canada, Germany, the UK and Thailand.